We live in a country (South Africa) plagued with high crime. Safety and security had become prevalent matters that cannot be ignored. To be safe is not a privilege, it’s a right. 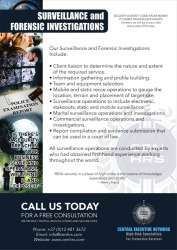 The question however, is, where does one find a trusted professional security establishment? It is here where we would like to introduce our company, Central Executive Network (PTY) Ltd. Initially established in 2008 with the following objectives: to deliver a security service of excellence and to add value in all we do. We believe security doesn’t come from money, it comes from relationships. It means we will be at your side every step of the way. Our services are rendered on the highest levels by trained experts to ensure that only the very best is good enough for our clients. 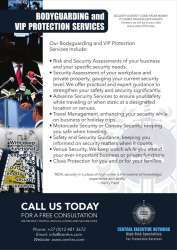 •	Site security by professionally vetted, trained and managed security officers. •	Quality control on all our contracts. 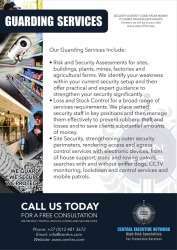 •	Retail and loss control services. •	Convoy and cargo protection Africa. 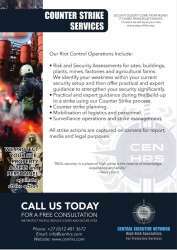 •	Riot and strike control management. Let us secure and protect the things that matter most to you – we keep watch, so you don’t have to. Please contact me directly on +27 828 422 299 / 072 333 7723 to find out more about our professional services.